View of the "hypersonic grid fins" that will help stabilize the first stage of SpaceX's Falcon 9 rocket during an attempted landing on a floating ocean platform on Jan. 6, 2015. SpaceX will try to make history with a daring rocket maneuver Tuesday morning (Jan. 6), but company representatives say success is anything but assured. 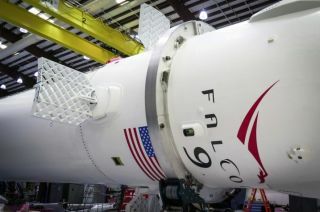 SpaceX's Falcon 9 rocket is scheduled to blast off from Florida's Cape Canaveral Air Force Station at 6:20 a.m. EST (1120 GMT) Tuesday, on a mission to send the company's Dragon cargo capsule toward the International Space Station for NASA. You can watch the SpaceX launch live on Space.com, courtesy of NASA TV, beginning at 5 a.m. EST (1000 GMT). SpaceX CEO Elon Musk has given the ambitious maneuver a 50 percent chance of success, and other company representatives have also sought to tamp down expectations. "It's an experiment. There's a certain likelihood that this will not work out right, that something will go wrong," SpaceX Vice President of Mission Assurance Hans Koenigsmann said during a prelaunch press briefing Monday (Jan. 5). "Nobody has ever tried [this], to our knowledge." On Jan. 5, 2015, SpaceX founder Elon Musk tweeted this photo of the "autonomous spaceport drone ship" that will serve as a rocket landing platform in the Atlantic Ocean. SpaceX will try to land the first stage of its Falcon 9 rocket on the ship on Jan. 6, 2015. Koenigsmann also stressed that getting Dragon safely to the space station is Tuesday's main mission objective, and that the first-stage return test is merely a secondary goal, albeit an exciting and attention-grabbing one. But SpaceX is committing to developing fully and rapidly reusable rockets over the long haul. Such a breakthrough could slash the cost of spaceflight dramatically, experts and advocates say. "I think it really would be a game changer in the space launch industry," Commercial Spaceflight Federation President Eric Stallmer told Space.com. Reusable rockets "would open up new markets and opportunities, new possibilities," he added. "If it does happen, it's really going to change the way we launch things." SpaceX has been building up to Tuesday's attempt for a while. For example, the company successfully brought a Falcon 9 first stage down for a soft ocean splashdown twice last year, once in April and then again in July. But those tests achieved a landing precision of around 6 miles (10 kilometers), while the stage will need to hit its target within 33 feet (10 meters) or so on Tuesday, SpaceX representatives have said. Tuesday's launch — which should be visible along large stretches of the U.S. East Coast — will also kick off SpaceX's fifth robotic cargo mission to the space station for NASA. The California-based company holds a $1.6 billion contract with the space agency to fly 12 such missions; the first four have all been successful. Another company, Virginia-based Orbital Sciences Corp., signed a $1.9 billion NASA deal to fly eight robotic resupply missions using its Cygnus spacecraft and Antares rocket. Orbital's first two flights went well, but the third failed when Antares exploded just seconds after liftoff in late October. Dragon is loaded with more than 5,000 lbs. (2,270 kilograms) of food, scientific experiments and spare parts for this latest journey. The capsule is scheduled to arrive at the orbiting lab early Thursday morning (Jan. 8); astronauts will then grapple it using the station's huge robotic arm. Dragon will stay berthed to the orbiting lab for about a month, then return to Earth for a Pacific Ocean splashdown and retrieval. The weather looks good for an ontime liftoff; the latest forecasts peg chances of favorable conditions at 70 percent on Tuesday morning. If the Falcon 9 doesn't get off the ground Tuesday, the next launch opportunity will come on Friday (Jan. 9).